Sometimes you can't help but enjoy a movie that, in your heart, you know is completely ridiculous but does exactly what it promises; has great action, simple plot and doesn't talk down to audiences. 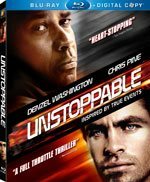 Unstoppable is that kind of film; it stars Denzel Washington and Chris Pine as two railroad operators who get caught up in an outrageous situation. Chris Pine plays Will, a new employee working for a railroad as a train operator. Denzel Washington is Frank, a veteran engineer working for the same railroad and is the one who has to train Will. Of course being the rookie at a new place Will gets some jibes from the other veteran guys there, but he isn't the kind of guy who takes adversity sitting down. He knows how to dish it out as good as the next guy. Despite some a rough start Will is eager to learn his job and has enough respect for it to do it properly. On another line headed for Scranton, PA a half-mile long train loaded with toxic chemical is barreling down on the town. Due to a malfunction the train is gaining speed with no hope of stopping it, if it crashes it will cause a disaster equivalent to a nuclear explosion. Frank and Wills train is on a separate line but since they are the closest ones to the runaway train they are asked to try and stop it. As they make their way, local authorities are trying to evacuate the town without causing a mass panic. Despite having no training Frank and Will both do their absolute best to bring down the runaway train. Things go from bad to worse when the line they are on is unable to intercept the runaway one. Having no way to catch up to the train with theirs now out of commission Frank decides to go off on his own in desperate attempt to stop it. Initially Will doesn't want to accompany Frank, he feels he has done all that can be done to stop the train but in the end though he ends up going with Frank. Of course the danger elevates as they attempt to board the train from a helicopter. What really works for this film is that it draws on elements that make for a great film. The story is very straight forward in that you won't spend much time trying to figure out what's going on. The characters are easy to identify and empathize with and the action doesn't come off as to unbelievable given the situation. Given the film is directed by Tony Scott, who worked with Washington on Man on Fire which was a sleeper hit for fans of the hit man genre it's not surprise to see that same magic come forth again with this film. Now on Blu-ray DVD all the high octane action can be watched at your leisure. With a film like this, the Blu-ray experience really delivers on every level; the picture and sound quality make for great movie watching. Along with the Blu-ray and standard versions come a bevy of extras including, audio commentary, a behind-the-scenes doc, a doc on derailing the train, the stunt work of the film, a talk with the director and cast and finally a look at the development of the script. Also on the Blu-ray disc is live lookup utilizing IMDB.com. Unstoppable is a fun and entertaining film that keep any movie goer and film enthusiast enthralled all the way to the climatic conclusion. Download Unstoppable from the iTunes Store in Digial HD. For more information about Unstoppable visit the FlickDirect Movie Database.